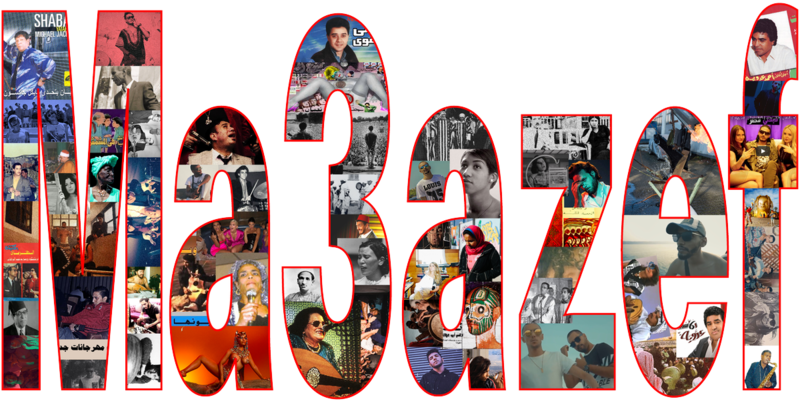 Ma3azef, whose tagline is “the first and last magazine of its kind,” was launched in 2012 as a venue for music criticism in the Arabic language. Authoritative, adventurous, and voracious, Ma3azef has pioneered close reading and long-form critical writing on music new and old. Ma’an Abu Taleb, the magazine’s founding editor, is a London-based writer and editor. His first novel, Kol El Maarek (2016), was published in English translation as All the Battles (2017). Tell us a bit about the origins of Ma3azef. It emerged out of a sense that there was a need to address a gaping hole in music criticism in the Arabic language. What was the state of music criticism in Arabic when Ma3azef was started out? Were Al-Ahram or Al Akhbar covering alternative music? Some of the newspapers did write about music, but it sounded like your dad trying to describe a meme. There was an unbridgeable gap, culturally and generationally, between the people who were making the music and the people writing about it. Journalists who knew very little about what was going on in the world, musically, still felt entitled to pronounce judgement on new music. Mostly moral judgement — calling it misguided and so on. Arabic music criticism has been virtually nonexistent since the 1970s. Well, there had been a tradition of critical writing in Arabic, in Syria and Iraq, especially. But there was no room for dissenting voices under Saddam or Hafez El Assad. The stakes were very high. Criticizing music was like criticizing the state — a lot of music was supported by the state. So naturally these things died out. What were they writing about back then? They weren’t writing about pop. I think there’s always been a sort of condescension toward popular music … toward pop culture in general. Including sports — there’s no literature at all about sport in Arabic, which is one reason I wrote about boxing in my novel, actually. I think it has to do with this idea that culture has to be high, literally high, above street-level. Which to me is just… I mean, don’t get me wrong, I like form. I like structure. I want to be moved by a work of art. I’m actually quite old-fashioned about these things. But I find this separation of high and low to be false and insincere. Culture is culture, right? And pop culture is compelling, there’s a reason people listen to it. It tells you a lot about where you live. We’ve found it difficult to work with writers who have been through the system, who’ve worked for the major newspapers and magazines — even younger writers — because of this attitude. This was one of the main reasons we started a music writing school a few years ago. It’s been huge for us. We do it online because it allows us to reach a very wide group of people — in Gaza, Syria, Saudi — who may not be able to travel. What’s the curriculum like? How does it work? It varies from year to year. I give an introductory class and then the final class, where I emphasize specific writerly things — how to build a narrative; sentence structure, tense, punctuation, metaphor. But the bulk of the program is taught by other members of the Ma3azef team, who are much better at writing about music than I am. Fadi El Abdullah gives classes on classical Arabic music. Rami Abadir, who is also a musician, lectures on electronic music and trends in criticism — how to identify good music, and how to address it in Arabic. He’s been a great addition to the team. Tamer Abu Ghazaleh, who founded Ma3azef with me, actually, and is a formidable musician in his own right, participated as well. Last year Kamilya Jubran, one of my favorite musicians, did a couple of classes on how to how to listen closely and attentively to music. Why call Ma3azef a magazine? What does it mean for you to call yourself that? It wasn’t a self-conscious decision, really. We publish at a certain rhythm, on different topics. We have regular contributors. It just seemed most accurate to say we’re a magazine. I don’t like “website.” “Platform” has bad connotations for us. People who call us a platform think that we’re here to promote Arab musicians. We’re not your platform. We’re not here to launch careers. If someone is making bad music, we’re going to say so. A punk band is not interesting for the mere fact that it’s from Cairo, or Ramallah. It’s interesting if it makes good music. It seems like Ma3azef is committed to pushing back on certain clichés about music coverage in the Arab world. Around the fetishization of “revolutionary” music, for example. This is something we are adamantly opposed to. We find these clichés patronizing and counter-productive — damaging even. I mean, you look at many of the Arab artists who are successful in the West right now, they’re the ones that have clean political stances. For too long, it’s been true that the world rewarded you for getting on stage and playing the victim. But we feel that our position as Arab writers and artists in the world gives us more insight into the human condition, not less. There was a period where it seemed like if you ever heard anything about music in Palestine, it was about Palestinian rap, which was celebrated in Western newspapers and magazines in an incredibly generic way. True. Actually that’s a very good example, because they managed to pick up on the worst Palestinian rappers. There’s a brilliant rap scene in Palestine. I mean, I listen to a lot of rap. I follow what’s happening in the US closely — the New York scene, the Atlanta scene, Chicago. And honestly, I listen to some of these people who are making music in Palestine right now with the same enjoyment, if not more. People like El Saleb Wahad crew, and BLTNM. But you never hear about them outside Palestine. You hear about rappers who write songs about, you know, honor killings. I mean, who’s that supposed to be for? This is becoming a big issue in the region — music sponsored by NGOs and human rights organizations. It’s a sinister and worrying trend. You know the Egyptian rapper, Zap Tharwat? His last album is quite bad — give it a listen yourself, if you like — but it is worrying because there’s a clear and crude anti-radicalization message. The lyrics might as well have been written by some executive at the World Bank. But you know, that’s okay. This is the whole argument for Ma3azef. If I were writing about Chinese music without knowing the language or the culture, I’d probably pick up on the wrong things, too. The important thing is that cannot be the only writing happening about Arab music. We need to have these discussions in Arabic, amongst ourselves, about our music — and about other musics, as well. Ma3azef is known for revisiting canonical figures, like the Syrian singer George Wassouf or the late Egyptian composer Baligh Hamdi — or even Uum Kulthum. We think there is a lot more to be said about these artists than what has been said over and over. Baligh Hamdi, for example, is posited either as a genius or as a landmark of mediocrity. We thought there was a more nuanced way to evaluate his body of work. There’s a tendency toward either adoration or dismissal, which we try to fight. (I’m not saying this is a uniquely Arab condition, by the way.) The point is that things are never black and white. George Wassouf is not the devil, nor is he a saint. The context being Wassouf’s very public support for the Assad regime. This idea that musicians and artists should be beacons of morality and tolerance is ridiculous. They’re people; they are flawed. When did they become moral compasses for the nation, and why do we expect that of them? Someone makes good music — that doesn’t necessarily mean I’d like to have a drink with them. The important thing to us is that Wassouf had an undeniable role in forming our soundscape. We all know a song or two of his by heart. He affected Levantine music, to say the least, and that’s worthy of a closer look. To be fair, some might be said to have taken on that burden voluntarily. People like Uum Kulthum or Miriam Makeba, for example. Some people will always take it on, and that’s fine. You could see Kendrick Lamar in that light, right? He’s a great artist. But then Young Thug is great artist as well, and… I’m not saying he’s morally dubious, but I don’t think he’s interested in playing that role. And why should he be? It’s that assumption, that artists should be moral exemplars, that I’m against. What about your own relationship to music? What were your earliest musical experiences. I grew up in Amman — an impoverished city musically and culturally. At home my father was constantly listening to classical music at a loud volume: Debussy, Bach, Dvořák — lots of Dvořák, Beethoven’s piano concertos. I had mixed feelings. I enjoyed it, but it also set up an ominous mood. My mother used to play us Palestinian songs of resistance. I loved those. I remember the first tape I owned. When my brother and I finally had some pocket money, we went out and bought the Shawwa’na tape by Amr Diab. The cheesy Egyptian pop singer?! I still remember the tingles I felt in my spine when we slammed the tape deck shut and that chorus kicked in. Has Ma3azef published a ten-thousand-word essay on Amr Diab? No, but we did publish something on him just last month that took him seriously as a composer and producer, rather than just a performer. It’s very good. Fayrouz Karawya wrote that — she’s a singer-songwriter based in Cairo. I think there’s a lot to be said about the kind of music that gets dismissed as trashy commercial pop music. There are reasons people engage with it. This was actually our point of departure for our dossier on jihadi music, which is one my favorite things we’ve done. A lot of people listen to this music — people who aren’t jihadis, who don’t share their beliefs, who just like to listen to these songs. Why is that? What’s going on? As a music magazine, we felt it was part of our mandate to take this music and engage with it seriously, because this is what a lot of people in the Arab world are listening to right now. For the… uninitiated, what is jihadi music, exactly? Is it recorded? Yes. The songs are mostly released on YouTube and Soundcloud, or on tapes. They’re of varying sophistication — I mean, this is what we try to explore. Where is this music situated, aesthetically; what are its origins. There’s the question of musical instruments, since, in the extreme understanding of Islam associated with jihadis, musical instruments are haram, right? But then some jihadi groups started using them — how does that work? We were interested in where the music came from — how this tradition was influenced by the reading of Qu’ran, and by El Nasheed — which are basically songs that praise the prophet — and also by things outside Islam, like regular wedding music. Wait, so is there a godfather of jihadi guitar or whatever? There is. A Syrian guy, who ironically enough is named Abu Mazen, about whom not much is known apart from the songs and the melodies he wrote. Mazen El Sayyed wrote a brilliant article where he called him “the inventor of the modern Islamic anthem.” This tradition we’re talking about started in the late 1980s and sort of bloomed in the last ten years, as you can imagine. You can read this one in English, actually, we had it translated. The whole process was intense. We went as far as we could with it, and I was genuinely nervous when it was time to publish. What were you nervous about? For a whole day. [Laughter] It was the hardest three hundred pounds I’ve ever earned. There’s a big market for that in London right now, for Arab guys who can do terrorist roles. I mean, I’d done voiceover work for a while — commercials, documentaries — but for the last year, all the work is jihadis. I had to stop, to be honest. There were a couple of times where it was especially… I won’t say upsetting, but it was definitely uncomfortable. You walk into the studio and the dude is telling you to pray. And I’m like — I haven’t prayed in years. But that’s the job. That’s why they want you. It’s uncomfortable. They also get a bit nervous when I show up in the studio — I do not look like what they think an Arab looks like. All that aside, I’m quite happy with the jihadi dossier. We also tried to subvert the genre a little — we commissioned four artists to write tracks inspired by jihadi music, to try and find some beauty in that ugliness, which we released as the Jihad mixtape. And I think we did. I’m also fond of a dossier we did on Ala’ Fifty, one of the founders of mahraganat music in Egypt. Yeah. It was strange, because we genuinely did not see anything controversial about it. It turned out that there were people who were happy to dance to Fifty’s music but were outraged by the idea of engaging with him as a person with ideas about life and politics and religion. It was pure class prejudice. Lots of people didn’t want to read it. It was shocking to us, to be honest, how violently it was rejected at first. But the piece instigated a real debate — I’d like to think that the quality of the writing helped — and eventually it took off. We still get a lot of hostility whenever we publish anything on mahraganat. One of the authors on the piece is Ammar Manla Hassan — he’s Syrian, he lived for five years in Cairo and now he’s in Lebanon. He took what we’ve been trying to do and ran with it, and now he’s pioneering a new kind of writing, especially when he’s writing about Egyptian trap music or mahraganat — without sentimentality and without disdain — and the coming together of these genres. His writing is compelling and sophisticated. He can detect stuff I wouldn’t hear in a million years, and he has insights into how these musics are evolving in real time. He’s really emblematic of our younger writers — they have fresh perspectives, and they’re able to take things a lot more organically. People like Hayaa AlMweil and Hala Mustafa. Or Abd-Alhadi Bazerbashi, who’s been writing a wonderful revisionist history of renaissance Arabic music. What’s exciting to you at the moment, musically? The trap scene, across the region — in Tunis, Morocco, and the Levant. It’s producing some truly astonishing music. My favorite, personally, is the stuff coming out of Palestine, which I was mentioning earlier. These guys have a sound and a lingo that is layered and coded, and the more layers you unravel the more tragic the music becomes. It’s music you can dance and wail to. Beautiful. They conjugate nouns, mix classical Arabic with vernacular, do wordplays I’ve never imagined. There’s El Rass aka Mazan El Sayyed, from Lebanon, who is to my mind a truly original artist and thinker. Zeina G. Halabi did a truly fantastic conversation with him, which will be available in English soon, as well. I’m also excited by Marwan Pablo, who we’ve been following from his very first track, which he posted under his old name, Dama. We did an extensive interview with him back then. He’s become widely known since, and it’s been quite thrilling to follow his evolution. There’s also Nadah El Shazly, whose debut album was one of my favorites last year. Amr El Alamy is doing a lot of exciting things — he has about five different monikers, but you can start with Al Shareef Tor5y. I like Zuli’s music a lot, and I’m always waiting for the next thing by Kamilya Jubran. A few weeks ago, one of our writers in Cairo got into a cab. He got to talking with the driver and it turned out that he reads Ma3azef. We had a little cross-continental drink together that night to celebrate. Virtually, since almost none of us live in the same city. Some of us have never met each other, despite working together every day for years. We’re trying to organize a get-together for our core writers, but it’s almost impossible — travel bans, visas, that sort of thing. Anyway, that was big. When we started, I said that we wanted Ma3azef to be read by taxi drivers, and people laughed. We want to give quality, intelligent content in Arabic to everyone and anyone who loves music. We want to be read by everyone. That is what we hope is next. Tell us about the mix. It’s the music that I’m most excited about right now — much of which we’ve written about in the magazine. The first half features contemporary trap artists from Egypt and Palestine who are doing some really brilliant stuff. The second half of the mix is mostly religious music, which I find very powerful aesthetically, and comes out of Quranic hermeneutics, Sufi traditions… some incredibly sad Shia songs. Just intense and beautiful music, which a lot of people tend not to engage with for whatever reason. I assure you, you can enjoy these without being one of the faithful.